If you are excited about kayak and canoe sailing, you've come to the right place! With over 25 years of real world sailing experience and design evolution, we at BALOGH™ SAIL DESIGNS, (BSD) offer the finest kayak / sea kayaks, canoe sailing equipment and air foils available anywhere today. Our sailing rigs have been put to the test on numerous expeditions throughout the world, and have earned their reputation as the most rugged, reliable, compact, and versatile sail rigs for this most demanding application. We have worked closely with veteran explorers like Jonathan Waterman (see Arctic Crossing: A Journey Through the Northwest Passage and Inuit Culture by Jonathan Waterman) to equip their expeditions, and have received many testimonials regarding the efficiency and reliability of our products (see Complete Folding Kayaker, Second Edition, by Ralph Diaz). 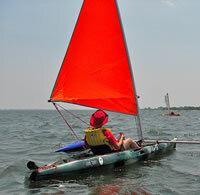 For sport and recreational use, BSD kayak / sea kayak and canoe sail rigs and outriggers are unequaled. They are easy to rig, offer compact storage, and present a bold, striking aesthetic. AND, they are designed to fit almost any stock or custom boat that you may have. When you know that our rigs could take you on an expedition above the Arctic Circle, or on a Gulf Stream crossing to the Bahamas, you can be sure that your weekend cruise will be a blast as well. And when the weekend’s over, the boat goes up on the car, the rig and sail pack quickly back in their bag, and when you get home fit easily into the closet or even under the bed. We make a wide variety of sail types and sizes to fit almost any application, from the perfectly balanced downwind TWINS™ rig, through the sprit-boomed CLASSIC CANOE to the full-battened BATWING™ SPORT™ and EXPEDITION™ rigs. Our sails are available "in stock" in a variety of beautiful color combinations, or you can order custom colors to match or complement your boat. Our carefully designed and precisely manufactured rigs are available either with or without detachable, inflatable outriggers (BOSS™- Balogh Outrigger Stabilization System). We offer everything you need, from balanced rudders to foil-section leeboards, and any combination of high quality hardware for custom applications. All of our products are made right here in the USA, by people that are long-time canoe and kayak sailors. We understand everything we manufacture, and make it all with care and thoroughness, as if it were going on OUR boats, and as if our lives and safety depended on it. All of our products come with complete and detailed instructions for their installation and use, and we are always available to answer any questions you have, or to help you understand what’s needed for your boat, and your sailing conditions. Look through the products on our website. We think you’ll agree that BSD offers the widest variety, and highest quality sailing gear for canoes and kayaks that is available today! We look forward to hearing from you, and maybe we’ll see you out on the water! Join the BSD USER FORUM! We do not share our information with others. 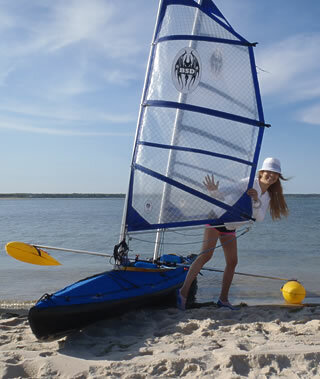 Sail Your Kayak sells and services all BSD kayak sails, sailing rigs & outriggers, BSD canoe sails & outriggers and are dealers for Folbot and Pakboat kayaks. up to 100 sq ft., for small boats. Additionally we repair sails (ALL sizes). Also available - custom canvas covers (awnings, boat covers), repairs or replacement. All content and images Copyright © 1999-2017 BALOGH™ SAIL DESIGNS (BSD) davev@baloghsaildesigns.com website by canopy studios,inc.